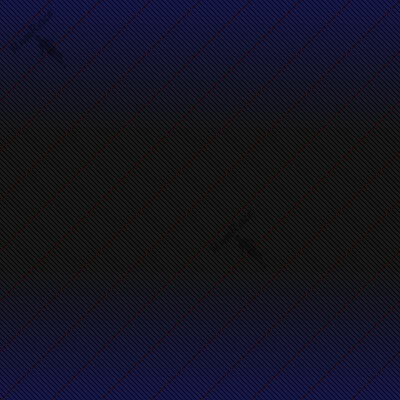 The information of your selected race is detailed here. Information is posted and managed by race directors. Although information listed here is assumed to be accurate it's a good practice to confirm with a race director or specific race website before planning to attend a race! Click for Terra Sans Pave - 2015! Prepare for primordial running, through forested trail and over green fields, full of fun & adventure but void of pavement. your choice between our race distance of 8 kilometers, or our one-lap tour of 4 kilometers. space for 200 eager runners... permit restrictions limit race participation to the first 200 registrants, which is a total combined count of participants within both events. terrific moisture-wicking tech race shirts for all registered runners and volunteers. chip timing & scoring with instant results published on RunRace.net for all participants. awards in both events for top-three overall, top-three masters, and top finishers in 10-year age groups for both sexes. an accurately measured, clearly-marked course, with a with well-stocked aid station at the start / finish area. afterward... join us for our post-race cookout with fun and surprises for all. our racecourse is preapproved by the Forest Preserve District of Cook County: permit approved! Registration is open... click the "Registration" tab above to submit yours! Note: Ample parking is available at Linne Woods grove, which is on the north side of Dempster St. For safety, we recommend that you approach Linne Woods grove while traveling a westerly direction on Dempster Street, then make a right turn into the parking lot. 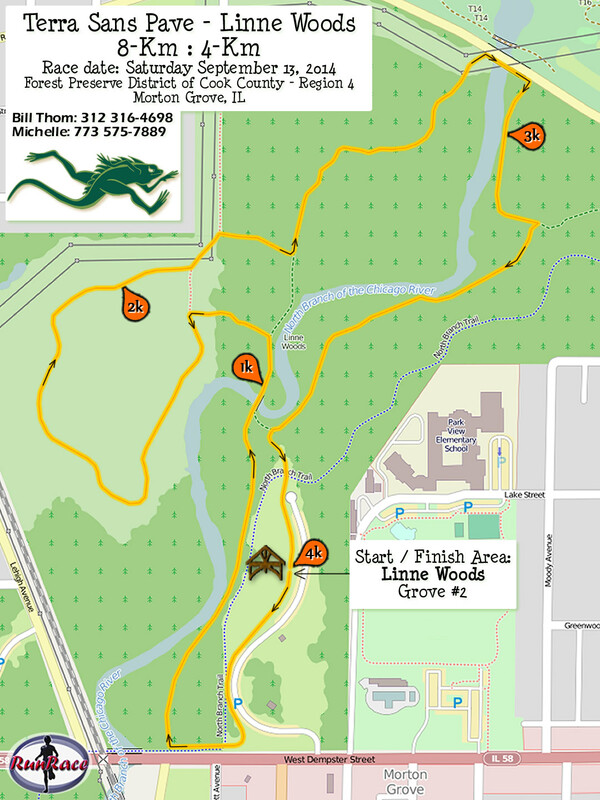 Our Terra Sans Pave - Linne Woods race takes place entirely within FPDCC Region 4, nearby the North Branch Trail system of the Forest Preserve District of Cook County, in Morton Grove. Linne Woods, Grove #2 pavilion serves as race start / finish area and our aid station. Our Terra Sans Pave race is ideal for first-time trail runners and those looking to post a fast time for "shorter" trail racing. A variety of surfaces make up our Terra Sans Pave racecourse... crushed gravel and wood-chip paths comprise about 85% of the course, with sections traversing grassy fields. You'll cross two bridges on each lap, and even run along the river bank. There are no man-made obstacles, nor river crossings but conditions may be muddy especially with rainy weather in the week leading up to race day. Expect mostly smooth, non-technical running with slightly rolling hills. Each lap is 4 kilometers (~2.485 miles) in length. Our Our Terra Sans Pave - Linne Woods race is a USA Track & Field sanctioned event. You may visit the USATF website by clicking either logo image.